I agree that the women's scent is quite heady, and much too floral for even my tastes. But the men's Gold is decidedly different. I have the Gold Cologne and find it to be the perfect frankincense scent. At first, quite rich and opulent, the scent quickly settles into a warm and aroamtic blend of woods (sandalwood really shine through, to my nose). These scents definitely vary among the concentrations and I encourage women to not be afraid to check out the men's scents! Now, I was really pleased to see that you managed to make this sound very nice without creating the felling that I must immediately run out and get it (which I can't afford to). But then Marlen had to come along and make the Men's Gold sound fabulous--and I remembered that I had heard this elsewhere! I am not afraid to wear men's scents; I am, however, afraid of spending more money than I would have thought possible (especially b/c I'm theoretically on a No-Buy:) Oh, well--another day; another lemming! This is quite a lush fragrance!You are correct in saying that this is something to only wear only special occasions because of its luxurious nature, but once in a blue mooon,it's just what I like!Now,I must try the guys fragrance after reading Marlen's suggestion!Sounds good too! M, I finally tried the women's version of Gold, but still agree with Marlen: the men's is better. The only Amouage scent I've been really tempted to buy so far is Ubar, which is unfortunately discontinued, and as you point out: none of them are cheap! Great bottles though. Thank you for the heads up on the men's scent. It sounds exactly what I hoped Godl for women would be like: starts richly floral, develops into an incense-wood blend. I must get my hands on a sample. I am not afraid to wear men's scents either, but those prices are indeed scary. As Marchlion points out below, even samples are not cheap at all. Everyone needs a super ultra uber luxurious scent like that, right? I might find a decant somewhere perhaps, but the bottle, the bottle!! I agree, naughty Marlen ! :-) Quite a while ago I've tried all but one of Amouage scents, because I was lucky to get samples for free...Of course the samples are gone and I have only vague recollections about the scents. I do have a sample of Ciel though and will post about it next week. Sadly, I don't remember Dia at all...is it supposed to be a "day-time Gold" scent? What a stunning bottle, I'd love to own this. Ahhh to be rich. Same here. I would love that bottle. Even empty. Have you seen the men's bottle? It is stunning too, supposed to look like a dagger. Actually want to reword my original comment...don't want to say that the men's is better, it is just more to my taste! Ubar is a much softer scent, starts out floral, very smooth sandalwood dry down. I don't like the bottle nearly as well as the men's & women's Gold bottles. OK FINE!!! You send me off to look at the men's bottle and and now I'm lusting after Ciel pour femme!! I was fine with the idea of letting these pass by! Oy! It's on your head missy! I like Ciel a lot, will post about it next week, it is much more wearable in everyday life. Oh, I finally need to try these fragrances! I only have a sample of Ciel, and I just put it on. Very lovely--fresh breath of spring to my nose. 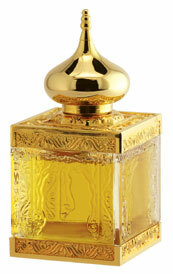 I hear that Gold has an element of Madame Rochas, because the wife of the Sultan of Oman loved that fragrance. Oh I think Marcy from Luscious Cargo sent me some samples of these awhile back. I must go home tonight and look. I must leave work now and go look!! I bought my 5 sampler pack of amouage frags for less than $20 and they gave me 2 extra, free. Found them on * bay. They last forever (almost), as well. Oh, I truly love this one, and yes I can detect the frankincense in Gold, but it such a perfectly composed fragrance that no one note stands out. It is present only to add depth to a stupendous floral. This is truly one of the greats. Ubar is probably my favorite of the line, however - it is a woody chypre that masquerades as an Oriental, it is so lavish. It lasts a very long time on the skin, and you will hate to wash it off. It has seemingly disparate notes of Muguet and Civet, Bergamot and Sandalwood. Somehow it all goes together perfectly. I was told by someone who knows these things that it is no longer made because the high quality ingredients demanded by the House of Oman are no longer available, and they will not settle for cheaper materials. I am so glad you can smell frankinsense in Gold (and I am a little envious). As for Ubar, you are the second person who says it is their favorite in the line. I must find a way to try it. My husband and I received Gold mens and ladies eau de toilette as gifts from my Indian husband's family who live in Dubai and, not being rich ,I had no idea about Amouage. I feel bad I accepted something so expensive but feel good that I can enjoy its exquisite scent! I'd like to say thank you again to Geeta and Ashok. I was looking for a cologne that wasn't so popular that I'd recieve comments like - nice cologne, my boyfriend used to wear that - so I looked outside the frame of offer at the local stores. Went to the net and bought Amouage Gold, for men, since I'm male. Naturally I had no idea how it smelt, but boy howdy, was I in for a surprise. At first it felt so intense I was overwhelmed by it, then it settled and I found the smell to be addictive, it's like a rose garden full of roses and plants, and you smell them all at once, but can never get enough. This perfume has a 'problem' wearing off. You can smell it on clothes for even longer than a week, eventhough I only sprayed directly on the skin, wore a shirt over it, then the sweater. My problems with this perfume: it does kind of require a worthy occasion, you don't want to wear this when going to go for a few beers with your buddys to the local bar, think Moe's from the Simpsons. Further, it's a bit heavy, and a little feminine, I suppose. As for the price, I think it's well justified, you do get what you paid for. For purposes of less formal occasions I bought Amouage's Arcus, which was a bit of a disappointment, but only in contrast to Gold. It's not that intense, I feel like it wears off much faster (still longer than regular perfumes) and the price should be lower. However, it's a wonderful scent, fit for pretty much any occasion, it's not heavy, but far from smelling... empty. If Gold tends to turn to feminine side, Arcus is a determined male. I must sound like I'm in a commercial, but I wouldn't trade those two for any other eau de toilette... I don't mind paying a high price if it's really worth it.